A study of one of Srila Prabhupada’s books, even a relatively small book, delivers big rewards. Srila Prabhupada’s Sri isopanisad – that small book decorated with Lord Visnu on the cover, benignly smiling back at any potential reader. In reality there is nothing small about this Vedic scripture. For me, a recent student of Sri isopanisad, the book has steadily increased in size, matured you might say, especially in its importance as an authoritative scripture on the subject of the true nature of the living entity – the jiva, we as soul. In my study of this Vedic Upanisad, I have several times found myself mystified by its ability to unlock unseen vaults of the heart, revealing particles of perceptions into true reality. Consequently it has ushered in a desire for me to know more, and to act more in uncovering life’s true treasure, the jiva’s eternal relationship as a servant of Sri Krishna , the Supreme Lord. An obstacle presents itself to any jiva intent on discovering truth: material conditioning, sprouted from the jiva’s ohso- regrettable desire to enter the mundane realm of relativity. The jiva seeks selfappointed lordship over dull matter and bodies, a lordship he hopes will deliver gratification of the mind and senses. A jiva thus covered by identification with the body and mind manifested from indulgences sinks into the deepest forgetfulness of its spiritual origin and devotional heritage. In that state of false ego, eons pass like the waves in the fathomless ocean, ending seemingly in eternity, the jiva bound in repeated birth and death in the cycle of species. I am such a jiva. That is my realization. I made this choice. My present situation is my relative reality. But now I aim to rediscover my true nature as a citizen of the spiritual world, the jiva’s eternal home. And this book, Sri isopanisad, shall be my companion and guide, mostly on account of its authoritative presentation by the great hero of the modern-day Gaudiya Vaisnava line, Srila Prabhupada. His literary voice is recorded in these pages, his self-proclaimed “written kirtans” (Letter, 1974). The book is a valuable map where X marks the spot of the treasure buried within. That treasure of the heart is dormant, lying neglected since time immemorial, yet still completely tangible and real. The verdict of Sri isopanisad on the subject of the origin of the jiva is brought to the attention of the reader in the very invocation mantra: purnat purnam udacyate (purnat – from the allperfect; purnam – complete unit; udacyate – is produced). The jiva is an emanation of the complete and perfect Lord, and is itself a complete unit, free in all respects to experience its completeness in its devotional relationship with the Lord. This is big news offered to any fortunate reader of this scripture. I find shelter in these statements of eternal truths. The weary obligations of mundane society and all taxing relationships, pertaining mostly to the body only, fade away in the background as unimportant. What a relief! My heart rejoices to know of the existence of that complete source who as the balance remains unaffected, no matter what happens on the level of relative reality. And I am connected to Him. He is that loving father in whom there is always shelter and never any embarrassment. He is that intimate friend who knows our hearts and therefore to whom we need not always express our troubled feelings or aching longings. He is that eternal guide who knows past, present, and future and is of unimaginable potency. For the benefit of all – even me – He creates the universe and gives us temporary bodies to act in His great play. Sri isopanisad gives great solace to any wayward jiva somehow stuck in the material world of mind and misunderstood ego. And our dear Srila Prabhupada, by his great mercy for conditioned souls, has the heartwarming ability to put into words the Lord’s mood and desire. “Factually, no one has to do anything more than to render devotional service to the Lord.” (Mantra 2, Purport) The simplicity of this statement is truly amazing, yet I find a deep and sublime meditation concealed beneath the surface. We live our lives as a granted experience, and this message from the spiritual world, delivered by Prabhupada, suggests that we waste much time in the relative. And we fail to acknowledge the waste. We are like a fish in the fisherman’s net struggling to free itself, not knowing that its vigorous attempts to escape only entwine it more and more. Like the fish, we end up in a state of suspended animation, with room only for occasional breaths, and then die. This is the gravity of the message of Sri isopanisad. Mantra 3 speaks of atma-hanaù, “killers of the soul.” Those demoniac beastlike beings, hands drenched in karmic blood, proclaim great advancement and deep learning. But they only sink down into the dominion of perpetual heinous suffering and intolerable existence. How lost they are to themselves! And what great need there is for the message of Sri isopanisad! I saw myself sliding down to some unknown destination sure to be a place of ultimate depression and wasted living energy. Now I refuse this lot. I choose the other way. I will heed the message of Sri isopanisad. As a result of this choice, I engage in the devotional service of the Lord, first by hearing and chanting His names, pastimes, and glories. Mantra 1 of Sri isopanisad tells us we each have an allotted quota and must not encroach on the property of others. In actuality, the opportunity to glorify the Lord is each living entity’s true quota. I will make proper use of this quota. I will, with whatever submission and thankfulness I can muster, take advantage of this chance for self-realization in the human form of life, extremely rare among the different life forms. I cannot waste this chance. This news gives rise to great optimism in my heart. This magnanimous attitude of the spiritual realm instills in me faith in this process. I can only pray that I will persevere and keep afloat in this ever agitated ocean of miseries, the material world. The causeless mercy of the Lord, my only beacon of hope, is His ever kind intervention in my life, be it guidance from within the heart, authoritative scriptures to rekindle my desire to approach Him, or the spiritual master and the Vaisnavas. In the introduction to Sri isopanisad, Srila Prabhupada comforts all readers, allaying their lamentations and feelings of inadequacy. “If you want to search out Krishna by studying the Vedic literature, then you will be baffled. . . . But you can very easily learn about Him from His devotees. . . . His devotee can deliver Him to you. That is the potency of Krishna ’s devotee.” Of course, Srila Prabhupada is himself that devotee, giving the Lord freely to all who seek out their relationship with Him, through this and Prabhupada’s many other books. 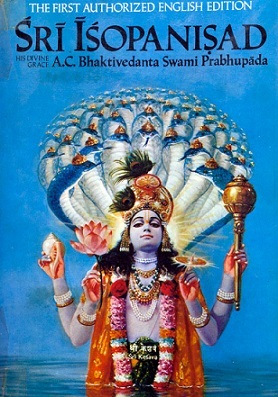 This study of Sri isopanisad, this real-life treasure hunt, although performed by a conditioned living entity, a fallen jiva like me, has at least produced one thing I can directly experience: I have increased my desire to engage in the devotional process, especially to invest increasingly more of my heart into the service of my spiritual master. This I consider a great success. Yudhisthira Dasa is a disciple of His Holiness Kadamba Kanana Swami. He was born in Norway and lives there with his wife and children and supports the local temple. A nurse by education, he is also an aspiring poet and the author of half a dozen books.